As the lyrics to the 1998 Semisonic song “Closing Time” remind us: “every new beginning comes from some other beginning’s end. On July 21, 2011 what was once a new beginning in human space flight ended at 5:57 a.m when Space Shuttle Atlantis (OV-104) landed at Kennedy Space Center following the completion of Mission STS-135, signaling the end of NASA’s Space Shuttle Program. 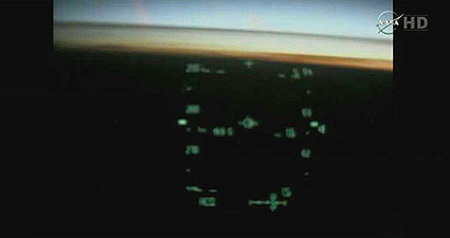 The mission, which began on Friday, July 8, 2011, delivered supplies to the International Space Station, lasted a total of 12 days, 18 hours, 28 minutes, 50 seconds. On board was a crew of four: Commander Chris Ferguson, Pilot Doug Hurley, Mission Specialist Rex Walheim, and Mission Specialist Sandy Magnus. 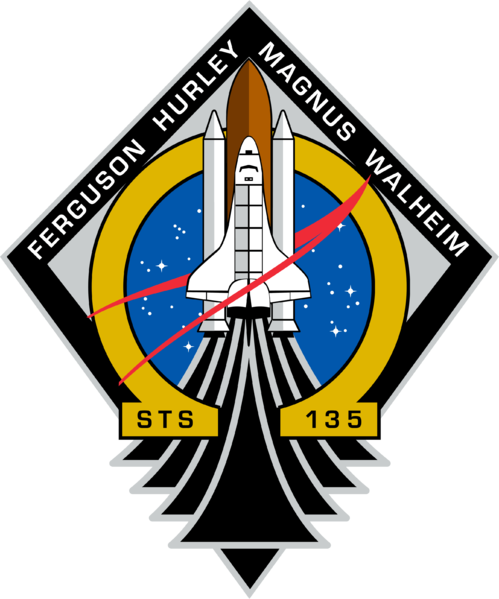 This was the final mission of the Space Shuttle Era which began on April 12, 1981 with the maiden voyage of Space Shuttle Columbia. Coincidentally this final shuttle mission coincided with another historical milestone: the 42nd anniversary of the July 20, 1969 Apollo 11 lunar landing. With the wonder of a child, I watched with rapt attention as the final moments of this 30-year adventure unfolded live online via NASA’s live video feed. I’ve always been enthralled with aviation — my grandfather, Papa, flew a C-47 in World War II and my Dad privately flew various aircraft, including a Cessna 310. But the Space Shuttle was especially significant. The program began when I was in first grade and during my formative years served as an enduring symbol of education and exploration. 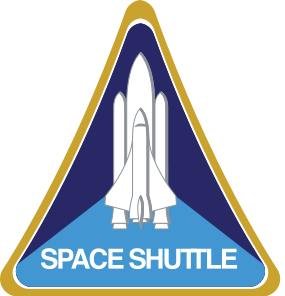 The Shuttle captivated my imagination by symbolizing “intelligence in action.” It also exemplified achievement over seemingly insurmountable obstacles. In the days before the Internet I watched on television as the Shuttle roared into the sky and then looked to the night sky as it streaked overhead like a shooting star. These were special times; moments that impressed upon me positive memories and feelings. Years later, I shared a similar moment with my sons — Jacob (then 7) and Max (then 5) — when we watched “Hubble 3D” in IMAX at the California Science Center. When the movie featured a Shuttle launch sequence my younger son, Max, turned to me with awe and fascination in his eyes. Later in the film, my older son, Jacob, stared excitedly at the screen and asked me how many stars there were in space! I felt especially connected to the Space Shuttle when, in 1990, Leroy Chiao, Ph.D., who grew up in Danville, California as did I was selected as a NASA Astronaut. He also earned a Master of Science and then a Doctor of Philosophy in chemical engineering from the University of California, Santa Barbara — the school that would later become my undergraduate alma mater. I was invited to meet Dr. Chiao with other high school newspaper editors at the Lawrence Livermore National Laboratory, where he was working at the time. He spoke about the Shuttle program and what he anticipated would be his role. 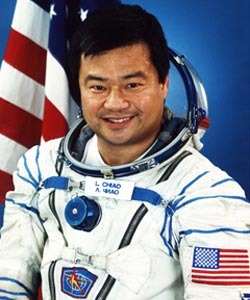 Notably, Dr. Chiao flew as a mission specialist on STS-65 (1994), STS-72 (1996), and STS-92 (2000). Dr. Chiao had logged more than 36 days, 12.5 hours in space, including more than 26 EVA hours in four space walks. He was also the Commander of Expedition 10 on the International Space Station (2004-2005). Dr. Chiao left NASA in December 2005. In April 2003, I attended my first academic conference — the International Academy of Business Disciplines (IABD) — in Orlando, Florida. I leveraged my proximity to the Kennedy Space Center and drove my rented Ford Mustang from Orlando to the historic spaceport. I also bought some items for my sons, including an orange Astronaut jumpsuit both of my sons enthusiastically wore for a Halloween. Although my visit was brief, being in that historic place was a powerful experience for me. 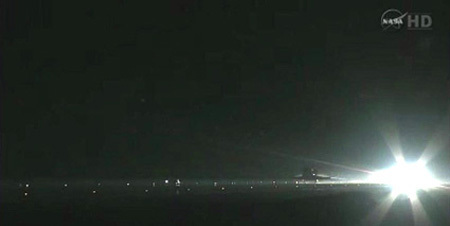 On November 30, 2008 I was captivated when Space Shuttle Endeavour was diverted to the backup landing option at Edwards Air Force Base on its journey home from mission STS-126 due to inclement weather in Florida. I was fortunate to have been able to record the double sonic booms as it passed over Santa Clarita and wrote a blog post featuring an MP3 file of the distinctive sound. Despite the many incomparable moments of inspiration, however, there were also times of great heartache. On the morning of January 28, 1986 I was prepared to give a speech about Christa McAuliffe to my sixth grade class when we learned about Space Shuttle Challenger exploding during launch. I changed my speech to one that explained the circumstances behind the Shuttle’s unfortunate demise. On February 1, 2003 — on the day I was planning to tell my family about the impending arrival of my older son, Jacob — I again found myself with a heavy heart when Space Shuttle Columbia disintegrated upon it’s return to earth after a mission. Despite these tragic times, the Space Shuttle will always be my generation’s inspiration — our Apollo program, our crowning achievement, our wildest dreams realized. The image of that magnificent machine launching like a rocket, orbiting Earth, and then returning as a powerless glider, will forever inspire and excite me. It saddens me that the Shuttle was discontinued without a replacement ready to go. Now, for the first time in 50 years, the United States will have no launch vehicle. Until a new one can be built, American astronauts will be ferried to the International Space Station aboard Russian Soyuz spacecraft. Commercial space vehicles will also begin operation in the near future. NASA is planning to build a Multi-Purpose Crew Vehicle for deep space exploration which is based on the Orion capsule, which was initially developed for cancelled moon-bound trips under the Constellation program. The chances of this coming to fruition in less than five years seems slim. Until NASA initiates a new program, I will celebrate the fact that Space Shuttle Endeavour being on permanent display at the California Science Center. Social Media Math: Google + Me = ? If you would like an invitation to join, please contact me with your e-mail and, once there are more spots available, I will send you one. When I first signed up yesterday morning there were invitations to be had, but 12 hours later, when I endeavored to invite a friend, the option was no longer there. It appears the system is once again closed to new users to prevent overwhelming the servers. Of course, the secondary benefit mirrors the most basic tenet of economics: scarcity drives demand. Clearly, there is significant interest in this latest social media initiative from Google. With some of their more recent efforts — Wave and Buzz — seeming to have disappeared before the end of their first act, it will be interesting to see what happens with Google+. I have taken Google+ for a few short test drives so far, but nothing too in depth. At the moment Google+ strikes me as very similar in almost every functional way to Facebook, though with the trademark Google simplicity of design and interface. I like the threaded discussions (as in Facebook) but for some reason it seems more free and open like Twitter. +1 Button: Clicking the “+1″ button on Google+ is similar to clicking “like” on a Facebook status update. In order to remove your +1, click the button again and it will be undone. Notably, Google has integrated the +1 button into all of it’s search results – and even into ads it serves – so if you find something you like, just click the +1 Button and it will be saved to your Google+ profile. Circles: Groups of people with whom you are connected and defined in any way that makes sense to you; also allows you to easily select with which Circles you share certain content. Hangout: Group video chatting allowing up to 10 users simultaneously. Sparks: News feeds about topics in which you are interested. One notable advantage over Facebook is that you can edit a post long after you’ve made it— something you can only do in Facebook immediately after you post content on your wall. It would not appear that is a “Facebook killer” but it is far too early to pass judgment either way. One nice aspect to Google+ is that it integrates with all of Google’s other online tools — the recurring theme of efficiency, immediacy and interactivity offered by Google+ with other Google products. Google+ definitely has potential to make a difference, yet the adoption seems to be slow. For some reason, despite its prowess elsewhere online, Google has struggled with creating a widely used social media platform. I wish them well in this endeavor. Generally speaking I am an admirer — and user — of many of Google’s services (it’s hard not to be given their extensive involvement in everything Internet). In March 2011 I began using an Android-powered phone; to say I am overwhelmingly impressed would be an understatement. Previously I used a BlackBerry and while it was good, it was not great. Android’s functionality and features quite simply blow me away. Two months later, In May 2011, I began using Gmail more regularly. (My new laptop failed and I needed a temporary solution to remain in touch with the outside world while I limped along with my old laptop). Once I began using Gmail to send and receive e-mail from my POP account, I suddenly realized the efficiency and effectiveness of the service. Notably, I really appreciate the immediate integration of my calendar and contacts between my phone and my Gmail account online. This was always an arduous task with my BlackBerry and one of my chief frustrations (in addition to my Curve 8330 being vastly under-powered and unable to run more than two applications at once). I have also discovered the ease with which I can save documents online and forego the need for a USB drive (for most cases). There are numerous other features offered by Google but those are just a few that I actively use. One thing I do like about Google+ is that it integrates with all of these existing tools that I already use. Again, the idea of efficiency, immediacy and interactivity offered by Google+ with other Google products. Overall, I am unsure what will come of Google+ and what to expect from it. I am also unsure in what way, if at all, it will change my social media practices and priorities. As it is, I am using social media more selectively and strategically, though I still find incredible value in my Twitter accounts (I use @MatthewAGilbert and @doctorious the most regularly) and Facebook; both allow me to learn and share knowledge while making professional and personal connections that have enriched my life. I also continue to teach several courses that directly or indirectly deal with social media and it’s impact on industries and individuals. Social media continues to evolve into an undeniable cultural and commercial force and my being able to teach it is a great way to continue learning about it. Looking forward, I am intrigued and excited to find out what will become of Google+. For more information about it, you might want to explore this CrunchBase profile for Google+ — I found it useful. Whenever or if ever you join Google+, I look forward to connecting with you there and/or engaging with you about it here! Have you declared your independence from indifference? How many of us truly pursue that which makes us happy? How many of us have a longing for something greater? How many of us envision a path we have not pursued? If obstacles were removed would we pursue our dreams? Do we limit ourselves with fear and excuses? Like the character Neo in The Matrix, there are times when we sense something is not right, but we choose the blue pill because we fear the reality of the red pill. Fortunately Neo embraced the unknown, but not everyone makes the same choice. Certainly, we all face limitations, but I encourage you to look to what is, rather than what is not. The past two years have been challenging and rewarding to me personally and professionally, but I continue working on moving forward rather than back. Reinforcing this philosophy, I recently received a fortune cookie that read “Discover the Power Within Yourself.” As trite as this message sounds, it inspired me. Taking those words to heart I continually re-frame my situation to see it realistically while retaining faith I will prevail in the end. So, whenever you find yourself encountering adversity, I encourage you to declare your independence from indifference and discover the power within yourself to achieve what you dream!